Last week, bus rapid transit (BRT) reached a global milestone, as the number of mapped BRT corridors and systems in BRTData.org’s database broke 400. As an online resource, BRTData compiles and tracks the development and progress of BRT projects globally. Additionally, the tool allows users to access data on infrastructure, performance, fleets, and road safety—equipping decision makers with the information they need to support local mobility solutions. BRTData’s most recent update shows that there are now 402 mapped BRT corridors and bus lanes, stretching over 5229 kilometers worldwide. 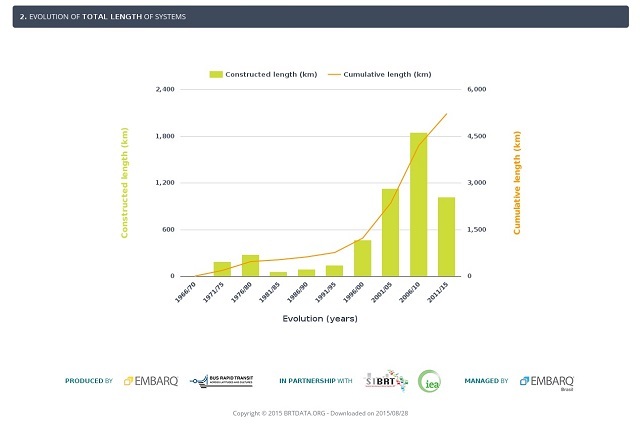 The significance of this figure is twofold: first, it shows that many cities worldwide are becoming increasingly interested in sustainable modes of transport; secondly, the figure is a reflection of the vast amount of free and accessible data that exists online to support the case for BRT. Every day, in 195 cities across the globe, nearly 33 million people use bus rapid transit. Despite BRT’s international success and rapid growth rate, its origins are humble, and date back to 1974. Beginning in Curitiba, Brazil, BRT started as a small, local project designed by Mayor Jaime Lerner as an alternative to expensive mass transport projects. At its core, BRT was a push to make bus systems more effective and user-friendly. As more cities continued to implement BRT systems, decision makers and residents alike began to realize the full range of benefits that BRT offers, fueling the transport mode’s expansion. Indeed, from 2004 to 2014, BRT nearly quadrupled in size, growing particularly fast in rapidly urbanizing countries such as China, Brazil, and Indonesia. However, even more promising is BRT’s future: 48 cities are currently expanding their BRT systems, while 141 more are constructing or planning new BRT projects. Overall, this success demonstrates cities’ dedication to sustainable transport and a growing shift away from personal vehicles. Moreover, this new data paves the way for better and more efficient BRT systems. Like any mass transport system, BRT isn’t perfect—but for some urban areas, BRT is decreasing congestion, improving air quality, and moving people through cities faster than ever. 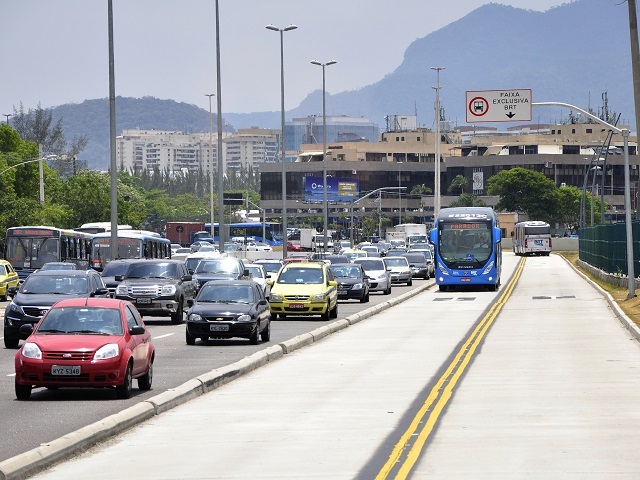 Consider, for example, Rio de Janeiro’s BRT system. Rio’s bus rapid transit system is particularly effective, serving 9 million people and saving 7.7 million hours every month. Each of the bus’s corridors—TransOeste (56 km) and TransCarioca (39 km)—replaces 126 cars on average, and consequently reduces CO2 emissions by 38 percent along these routes. BRT has had similarly positive impacts in other cities. Research by WRI found that “In Istanbul, the average passenger on Metrobüs saved 28 workdays per year in reduced travel times.” Likewise, Bogotá, Colombia will save an estimated $288 million in avoided traffic injuries and fatalities due to its new BRT system, from 1998 to 2017. With the proper implementation and in the right environment, BRT is well positioned to transform and integrate public transport in efficient and cost-effective ways. BRTData’s new landmark points to exciting new growth in BRT—but it’s the data behind this achievement that will effect the most change in urban transport. Indeed, one of the largest barriers BRT has had to overcome is the uncertainty cities face when attempting to implement it. Given how young this new form of transport is, adapting BRT to a city’s local context can be messy. In Delhi, India, for example, BRT has encountered unique challenges, such as major resistance from car owners, fierce competition with metro systems for funding, and lackluster public relations exacerbated by local media. However, these difficulties are being recorded in online databases and BRT’s triumphs are being shared. The lack of data on BRT in diverse environments is being filled and made accessible thanks to tools like BRTData, and a record number of journals are publishing reports on bus rapid transit. Indeed, since Delhi’s rocky start, India has pushed ahead with BRT, learning from past challenges and implementing best practices going forward. With 141 cities currently planning or constructing new BRT systems, online data is key for ensuring that this new transport mode sees even greater success in the future. Created in 2012, BRTData is an online tool produced by the BRT Center of Excellence – Across Latitudes and Cultures (ALC-BRT CoE) and EMBARQ, sustainable urban mobility by WRI, in collaboration with the Latin American Association of Integrated Systems and BRT (SIBRT) and the International Agency for Energy (IEA).